Loop receiving stations, as they were known, were operated by the United States Navy. They were used in WW2 as part of the Harbor Defenses and consisted of indicator loops, controlled minefields, boom nets, fixed sonar (the Herald: harbor echo ranging and listening devices). This page deals specifically with the indicator loop antisubmarine defences at Fort Tilden, New York, USA. During WW II, the New York Harbor was monitored by two Advance Harbor Entrance Control Posts (HECP), one located at Fort Hancock, Sandy Hook, the other on the opposite side of the bay at Fort Tilden, Rockaway. Both Advance HECPs were part of a complex harbor survey system, which included radar, hydrophones and magnetic detection loops. For harbor surveillance, both Advance HECPs were equipped with SCR-582 harbor surveillance radars. According to the available technical descriptions, the SCR-582 was capable to detect surface targets (ships) at night and poor visibility up to a range of 90000 yards. Both stations easily could monitor the Ambrose Channel. HECP#2 (Fort Tilden) became operational on August 6, 1943. The New York Harbor Entrance Control Post (HECP) was located at Fort Wadsworth in Staten Island, NY. The Advance HECP #1 was located at Fort Hancock, Sandy Hook, New Jersey, while the Advance HECP #2 was located at Fort Tilden in Rockaway, New York. These HECP facilities served to control and coordinate the joint task of harbor defense among the US Army and the US Navy. Each was staffed by officers from both services. 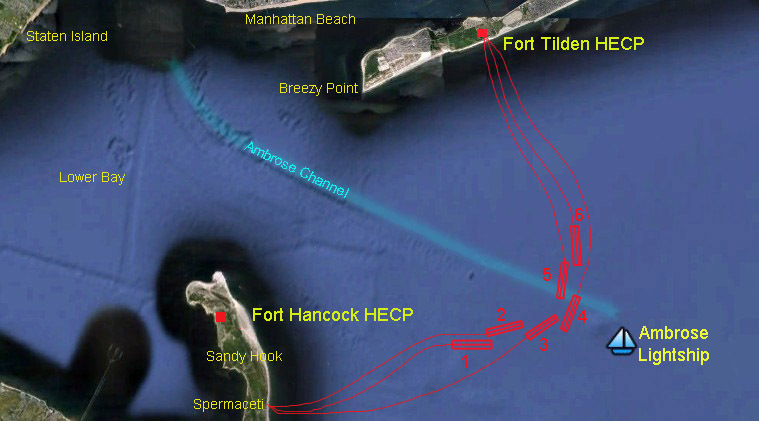 The HECP at Fort Tilden handled the East side of the Ambrose Channel of the New York Harbor. A bunker in Fort Tilden served as the Advance #2 Harbor Entrance Control Post (HECP) for the New York harbor during World War II. It went into operation on August 6, 1943, although construction was not completed until December 13, 1943. Installation of the 50 foot observation tower, located behind the HECP bunker, was started on March 13, 1943, and completed in September 1943. This tower had an electrically heated, wooden topside structure, approximately 16 feet square, with a 2' 6" wide catwalk that extended around the structure. The tower was constructed by the Ordnance Department for use at the Sandy Hook Proving Ground. When the Proving Ground was discontinued in 1919, the tower was transferred to the Coast Artillery and pedestals and fire control optical instruments were installed by the U.S.E.D. in 1926. The function of the HECP was: "to collect and disseminate information of activities in the defensive sea area, to control unescorted commercial shipping in the defensive coastal area, and to take prompt and decisive action to operate the elements of the harbor defense, in order to deny enemy action within the defensive coastal area". The HECP was also tasked with maintaining a navigable entrance to the New York harbor by preventing enemy ships from laying mines or scuttling themselves to block the harbor entrance. The Advance HECP #2 at Fort Tilden was used to identify ships approaching the Ambrose Channel from the waters off Long Island, and to keep fishing vessels and pleasure craft out of the restricted areas off the shores of Fort Tilden. The Advance HECP #1 at Fort Hancock performed similar duties on the West side of the Ambrose Channel. This structure was built into the remains of Battery McCook (8, 12" Mortars, 1898-1923). When an unidentified vessel entered the defensive area, the HECP would direct a blind challenge, if an immediate response to the proper code was not received the HECP would organize a powerful offensive attack. If the harbor surveillance radar indicated that a surface ship was approaching, the area was illuminated with spotlights, and a warning shot was fired from the coastal gun batteries. If the intruder failed to stop, the batteries would open fire upon the ship. If the intruder did stop, a patrol vessel would be dispatched to investigate. If the unidentified vessel was detected by the undersea magnetic indicator loops and no surface ship was detected by radar, a submarine was presumed to be in the harbor. Any friendly vessels approaching the harbor were advised to stay clear of the harbor, the harbor patrol was notified and the submarine net gates were closed. All communications were conducted by landline telephones, backed up by two-way radio equipment. Light and flag signals could also be used for communications. A staff of four officers and 20 enlisted men were authorized for the HECP at Fort Tilden. Fort Tilden's HECP was located in an casemate equipped with a ventilation system designed to protect the occupants from poison gas attacks. Plumbing, electrical, communications, and dehumidification systems were installed to serve the staff and equipment. 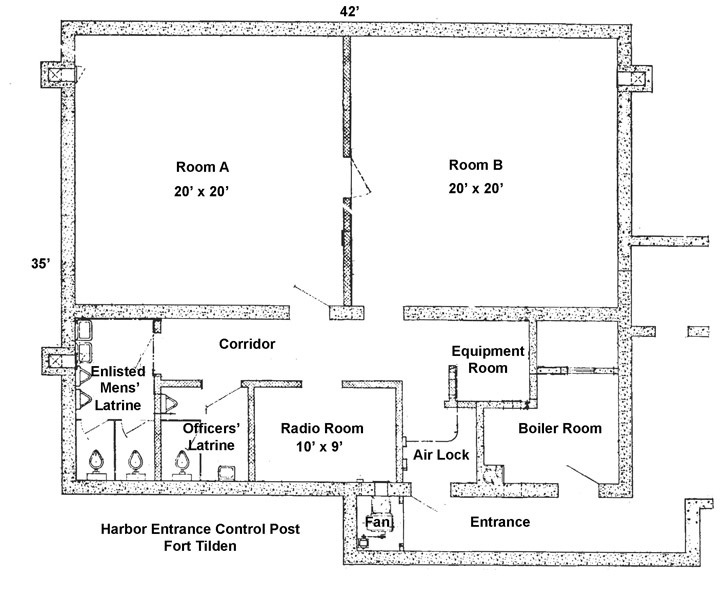 The bunker contained two large rooms designated Room A and Room B, an enlisted men's latrine, an officers latrine, a radio room, and a central corridor. The bunker had it's own boiler room, coal bin, cable hut, and is accessed through an air lock. The floors were covered with linoleum tiles and the ceiling was covered with 2" acoustical material. Advance HECP went into operation on 6 August 1943 at Fort Tilden, Rockaway Point, Long Island, New York, an Army fort constructed at the time of World War I and greatly expanded during this war. Preliminary surveys for the installation of this HECP unit considered a structure on the top of the Half Moon Hotel, Coney Island, or the Army Radar Tower, Fort Tilden, which had an elevation of 173 feet. Both these sites, however were rejected in favor of its final location, as more central for joint Army-Navy action. The principal tactical mission of Advance HECP #2 was to establish the identity and to determine the character of the ships passing along the Long Island shore before approaching Ambrose or Rockaway Channels. Its main secondary mission was to prevent fishing vessels and pleasure craft from entering the restricted area before the Fort Tilden gun emplacements. 1. Ship plot was maintained in the contiguous waters. 3. A radar sweep was theoretically possible by means of an auxiliary SN radar unit, but actually this unit was unsatisfactory in operations, as it rarely could reach out to the extent of the loops, (as explained in the section on RADAR). Joint Army-Navy Operations Room, occupied 6 August 1943 and wholly completed 15 December 1943, 400 square feet of floor space, 4,000 cubic feet of space, located in bomb proof center built by Army for HECP and Command Post, heated by forced warm air heat; Tower and Generator shack (Army owned and erected for HECP and Command Post.) Tower located back of bomb proof, 50 feet in height, electric units heated topside structure, 256 square feet of floor space, 2400 cubic feet, 2Â½ foot catwalk on outside, 4 sides 43 feet high, 60 feet above. Used head in bomb Proof shelter. Fort Tilden HECP, drawn 1946. Total complement authorized was four officers and 20 enlisted men. Enlisted men were housed in a double deck Army barracks and messed with various Army batteries until August 1944, at which time they were transferred to the Fort Tilden Coast Guard Station mess to give them the benefit of the best possible mess. Officers were housed in Army Bachelor Officers' Quarters and messed with Fort Tilden Army Officers mess. Recreational facilities of the Army at Fort Tilden were made available to all Naval Personnel on duty there. The station beach, which included three clubhouses, one for officers, one for a searchlight moved down from Fort Tilden, to serve as a Navy Signal and Mine Watching Station, it the ship traffic required an extension of the existing signal system, but this contingency did not come to pass, and the tower was never regularly operated. The authorized enlisted complement was as follows: 1 CBMA, 6 SoMH2c, 4 SoMH3c, and 1 SC-Striker-S2c; total 13. This Unit was set up under orders of 11 December 1941, providing for magnetic loop installations for New York Harbor. This station was located at Atlantic Beach Coast Guard Station on Far Rockaway Inlet, Atlantic Beach, Long Island. At this time the station was known as Naval Unit -#2. Two magnetic loops were laid, known as Loops 3 and 4. The shore equipment consisted of three fluxmeters, two in use and one spare, and telephone communication to HECP at Fort Wadsworth. A fluxmeter and visual watch was maintained by one chief and eight seamen starting 14 March 1942. All crossings on loops were reported by telephone to HECP and the visual watch attempted to identify the ships making the signatures, Because of technical difficulties experienced, due to nearby railroad (discussed below,) it was decided to move the station from Atlantic Beach to Fort Tilden. Concomitantly it was decided to improve the procedure of reporting the movement of vessels in New York Harbor by the establishment of two advance HECPS. Shortly after 17 September 1943, Naval Unit #2 became Naval Unit 3-B and was set up as an organization separate from the Advance HECP #2, but working closely with it. In place of the two unsatisfactory loops (Numbers 3 and 4) originally laid from Atlantic Beach, three loops were laid with Fort Tilden as the shore terminus. When completed the loop system had as its approximated eastern edge, a line from the HECP Tower to the Ambrose Lightship. The tail cables were brought into a bombproof shelter where four fluxmeters were located. Subsequently it was decided to relay three new loops in place of the original two. The new loops gave excellent results. Loop 4 was able to operate at the highest sensibility most of the time and loops 5 and 6 gave fine results, but being closer to shore experienced greater disturbances than loop. Indicitave layout of the six indicator loops across the Ambrose Channel (New York/New Jersey) 1944. This layout is only an approximate indication of where the loops were placed as no maps have been located. Each 'three-legged' loop was 400 yards wide and 2000 yards long. They had to overlap somewhat so as to prevent dead spots between them. Tail cables joined the loops to the shore stations. They were made to a different specification. The limitation of these loops were only those of the system and the equipment used. A more sensitive loop could have been used. Clear signatures were obtained on all but the smallest trawlers used in fishing and 38-foot, private cabin cruisers. Multiple turn loop systems with discriminators could probably pick up these craft. The water conditions on the eastern side of the harbor are very favorable to the use of loop equipment. The loops laid across the Western Approaches to the New York Harbor (Shore Terminus; Spermacetti) gave satisfactory performance. On 12 April 1945 Loop 3 was put out of operation when the outer leg of the loop was cut by a ship dragging anchor. This was never repaired, and shortly after cessation of hostilities in the European theater, on 28 May 1945, all loops were secured. In the final analysis it is the opinion of the last Officer in Charge at Fort Tilden that magnetic indicator loops were the most successful of all detection devices used in New York Harbor as their findings were scientifically exact, and independent of human analysis. (1) When the loops were first laid from Atlantic Beach and Spermacetti Cove, none of the men were familiar with the equipment with which they were working. In addition, visibility was such that it was often almost impossible to identify vessels at any great distance during the day and totally impossible at night. (2) The original loops (out of Atlantic Beach) were far too long and were not laid tightly enough. The cable could swing with the sea action, causing wide swings of the recorder pens. (3) It was also found that the Long Island Railroad, which ran an electric line that paralleled a mile of the tail cables, caused even more perturbations. The smallest ship that could be picked up by the installation was a harbor tanker. Even these signatures were very difficult to distinguish from the disturbances recorded. They could only be identified by the shape of the signature as the magnitude was not greater than that of the perturbations. The watchkeepers became skilled at distinguishing signatures but at no time could confidence be placed in the results obtained by the Atlantic Beach Station. (4) The greatest and most problematic difficulty was the destruction of loops by merchantmen dragging anchor in restricted cable areas. (These ships were anchoring in restricted cable areas up to the last week of HECP's operation, despite all warnings and protests). (5) Much intelligence gleaned from loop signatures was obscured, reduced in value, or rendered useless by multiple loop crossings. These uncontrolled crossings continued up to the time the loops were secured. In order for loop signatures to of maximum intelligence value, it is necessary for traffic to be so regulated that not more than one ship at a time crossed a loop. (6) From time to time there were unverified loop signatures, which after deliberation and experience, were believed to have originated spuriously due to the normal diurnal (daily) changes in the earth's magnetic field, or from electrical storms. (1) ComTHREE letter dated 4 February 1944 addressed to BuShips, tells of the success of the trial loop: "Definite indication of direction was obtained with this trial loop as evidenced by enclosure (1), a photostatic copy of a sample signature on fluxmeter tape, giving authentic evidence of desired results, which shows typical signature of an inbound and an outbound vessel." (Appendix GG.) The trial loop was laid with the distance between the center leg and outer legs. Therefore, an outbound vessel makes a signature wherein the time required to cross between the inner and center legs is approximately twice that required for crossing the center to outer legs. An inbound vessel gives a reverse type signature. (2) "On 3 January 1944, ships anchoring in a north-easterly storm, dragged anchor and cut all three legs of this loop. As other ships also damaged tactical loops #2 and #3, priority was given to the repair of those loops prior to repair of the test loop." (Trial loop was never made workable again.) Loops #2 and #3 were repaired 28 February 1944. (3) Although the exact dates on the Unit 3-C log is not now available, it was learned through telephone conversation with an officer in the Radio Material Office that loop 2 had all three legs out by a ship dragging anchor in the fall of 1943 at about the same time loops 3 and 4 were being picked up at Atlantic Beach. (4) Technical consideration made it advisable to create two loops in place of the one damaged loop 2, this being done by running out another tail cable. (5) As a result, the loops monitored at Spermacetti were redesignated as follows: loop 1 remained same; loop 2 make into two loops became 2A and 2B, When the loops at Atlantic Beach were picked up, and three new ones subsequently laid, these were designated 4, 5, and 6. In line with this changes loops 2A and 2B were redesignated 2 and 3 respectively. New York Harbor hydrophones were Army installed and Army operated. Located on the ocean bottom, the acted like large telephone earphones and were wired into a "squawk box" located in the mine case mates at Fort Wadsworth, Fort Hancock, and Fort Tilden. Hydrophone signatures were essentially as difficult to analyze as sono-bouy findings, due to the heavy traffic of New York harbor in constant movement. 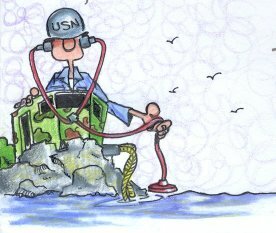 A destroyer might be calibrating off Cholera Banks and drop a practice exercise "ash can." Any hydrophone was sensitive enough to record it, way back in the Narrows. 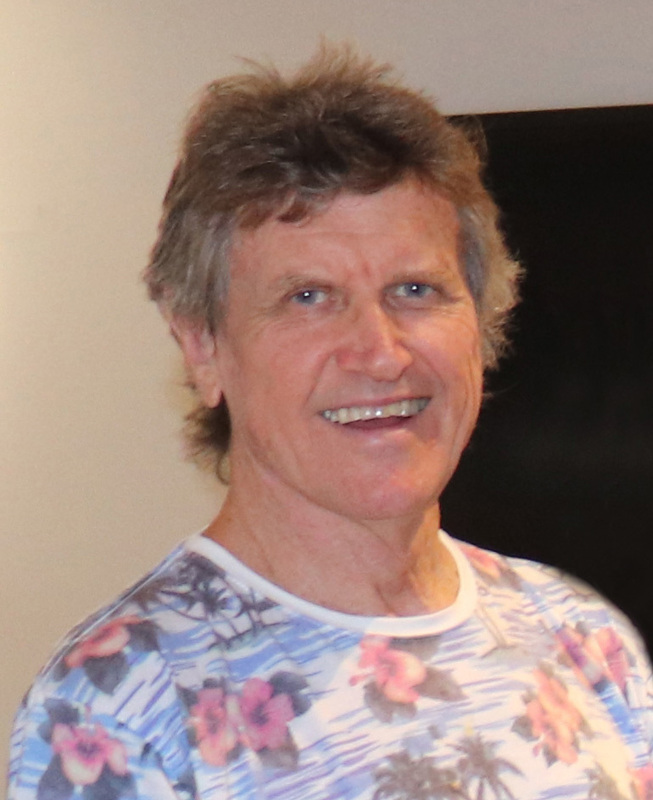 But although the hydrophone signature made it known that an underwater explosion had occurred, a basic operational inadequacy lay in the fact that there was no way of knowing from which direction or at what distance that explosion occurred. In the course of the war, the positions of the hydrophones were moved many times. In actual operations they proved of doubtful value. Furthermore, no real attempt was known to have been made by the Army to tie them in with HECP activity. The nets and booms of New York Harbor were laid by the U.S. Navy Net Depot, Bayonne, N.J., and came under the command of Commander Ambrose Section although the two net vessels came under the tactical command of HECP Fort Wadsworth. These vessels consisted of the YNG-3, whose chief function lay in assisting when the net gates were closed and opened, and the YNG-39, the 'flag' ship, whose signal bridge was manned 24 hours a day, always by one man but in heavy traffic by two men. Neither of these vessels had any propulsion but were moved by tugs. Each had a power generator for electricity and steam. The YNG-3 was put into position on 27 November 1941; then at a later date the YNG-39 was added, taking the old position of the YNG-3 on the west side of the Channel. (1) The first function of these ships was to control the net gates, of which there were two. In the early stages of the war the main gate was usually closed from about 0000 to 0300 hours, but later when convoys were routed to depart late at night it became the practice to leave the gate open at all times, except in emergency on order of the HECP. The auxiliary gate when installed was open only when large convoys were in movement, and was operated by a third YNG put into position in the spring of 1944. (2) The second function of these vessels was to assist in the identification of harbor traffic. Each ship, whether inbound or outbound, was challenged before she reached the gate. Flags were used by day, blinkers by night. Movements were regularly checked with both the Ambrose Guard Vessel and HECP, Fort Wadsworth. (3) A third and highly strategic function was to provide a watch by means of underwater sound gear. The YNG-39 was equipped with both listening (Hydrophone) and ASDIC (Sonar) devices. During poor visibility she maintained a constant search to the seaward. (4) A fourth and purely courtesy function of the net vessels was to assist the Degaussing Section at Swinburne Island by directing vessels to the proper area for degaussing. The YNG-39 possessed one Magneto type telephone circuit, Navy laid, to Hoffman Island, which provided direct communication with HECP, Fort Wadsworth and with Swinburne Island. She had no radar and only a small radio transmitter and receiving set, suitable for conversation with the HECP Roving Patrol YP's and with HECP Fort Wadsworth. The YNG-3 had neither a telephone or a radio and relied purely on visual signaling with the YNG-39 for her communications. The YNG-39 was armed with one 50-caliber machine gun, two 30-caliber machine guns and one 1-pounder or "heave to" gun. The YNG-3 was unarmed except for Thompson machine guns. To maintain the ship in a state of readiness the YNG-39 in the early stages of the war called "general quarters" once a day. Personnel consisted of two officers and eighteen to twenty-two enlisted men. All enlisted men were assigned from the Naval Frontier Base, Tompkinsville, Staten Island. The watch bill was so arranged that each man had six days aboard the net vessels and two days ashore. Nobody took regular watches except the signalmen on the bridge who stood four hours on and twelve off. When the net vessels were first put into operation all personnel was white; in February 1943 the first African-American personnel were put aboard, and finally all enlisted personnel were Black. Sometime after VE Day (exact date unknown) the Coast Guard too over the operations of the vessels at which time all Naval personnel were removed. Transportation to and from the shore was provided by a YP from the Naval Frontier Base, which was also responsible for bringing out the food and other ship's supplies. The YNG-3 was left temporarily at the Narrows while the YNG-39 was given a complete overhaul, and her winches removed. From 28 July 1945 the YNG-39 then resumed her former position in the Narrows as a traffic control vessel. 3/4/42 -- A submarine was sighted 1.5 miles offshore at Beach 97th Street in Rockaway heading westbound. Seven patrol vessels responded to patrol the area with negative results. 5/21/42 -- 0430 Hours, HECP (Harbor Entrance Control Post) reported a signature on loop 2B (Rockaway and Ambrose). Craft identified as on surface. Being investigated by Navy. 7/14/42 -- "2030 Hours, Policeman and Army observer reported sighting sub one mile off Rockaway Beach, L.I. Several boats were sent to investiagte and found nothing. 10/13/42 -- Unidentified signal on loop in vicinity of Ambrose, not on radar. Position 1 and 3/4 miles NW of Ambrose. 10/23/42 -- EDC reported contact on loop 2B. Nothing found. 11/8/42 -- HECP Wadsworth reports vessel CARETTA collided with net at gate. 11/17/42 -- 0844 Hours, Unidentified medium sized vessel signal on loop 2B. Also at 1103 Hours, a medium sized vessel outbound, at 1111 Hours a medium sized vessel outbound, and at 1116 Hours a medium sized vessel inbound. Visiblity poor. 11/24/42 -- 1448 Hours, Unidentified medium sized vessel signal on loop 2B. Possibly one of 3 minesweepers in area. At 2109 Hours, an unidentified small sized vessel signal on loop 2B in Ambrose. Radar cannot classify. HECP reports target is outbound at 4 knots. CG 83342 was sent out and nothing was found. 11/25/42 -- An unidentified small sized vessel signal on loop 2B in Ambrose. Radar unable to identify. 11/30/42 -- "0439 Hours, EDC received report from HECP NY that between 0439 and 0511 five unidentified vessals were coming in over loops 2A and 2B. Gate immediately alerted to close. Position of vessels: Azimuth 175 S 19,000 yards. Range from Water Witch radar station. At 0625 gate was ordered closed. Harbor defenses alerted. Blimp and 5 SC ordered to search. Gate was reopened at 0800." 12/2/42 -- Unidentified signal on loop 2B at Sandy Hook. 12/5/42 -- Unidentified small signal on loop 2A, no radar contact. 1/17/43 -- HECP NY reported Sonobouy 14 and 16 recorded small signature at 2230 and 2231. Gate closed 2318 until it was reopened at 0207. 2/27/43 -- HECP NY reported that CG 38477 (38 foot) ran into gate obstruction north of YNg3 (Gate Tender). She was abandoned and sunk in 30 feet of water. Note 1: Lat-Long coordinates are provided for plotting purposes, to locate sites with GPS navigation units, and to utilize the Microsoft Terraserver Satellite photograph database. Note 2: Comments in italics added by author to reflect actual locations.